If you are diagnosed as lactose intolerant, the good news is that you don’t always have to follow a dairy-free diet, some people can still tolerate small amounts of lactose. The symptoms of lactose intolerance are dose-dependent; in other words smaller doses of lactose may be tolerated but larger amounts may cause symptoms. It may take some trial and error but you will learn which dairy products you can still tolerate and in what quantity. Not all dairy products contain the same amount of lactose. For example, milk contains approximately 5g of lactose per 100ml while a thick yogurt (Greek style) contains on average less than 1.5g per serving and hard cheeses like Cheddar contain on average around 0.1g. It all depends on the nature of the product and level of fermentation it has undergone. Cutting down on milk and dairy products, or swapping for an alternative plant-based product, may mean that you could be missing out on the important vitamins and minerals that a diet with dairy provides. 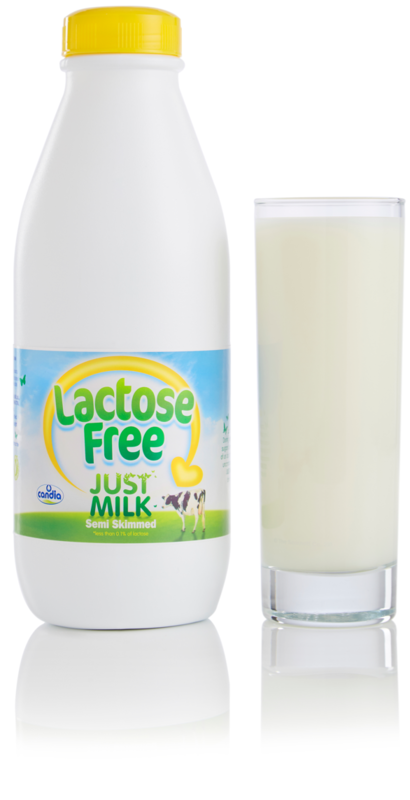 JUST MILK Lactose Free* provides all of the nutritional benefits of milk without causing any of the symptoms associated with lactose intolerance. JUST MILK Lactose Free* is an important source of many essential nutrients, including protein, calcium and B vitamins, and plays an important role in keeping teeth and bones healthy… perfect for the entire family. Now you can enjoy all the same foods and health benefits of milk as part of a healthy balanced diet. So choose a bowl of cereal before work or a large latte at lunchtime. Enjoy a refreshing milk shake, or a naughty slice of cake. With JUST MILK Lactose Free*, the choice is yours again.